This book broke my brain. 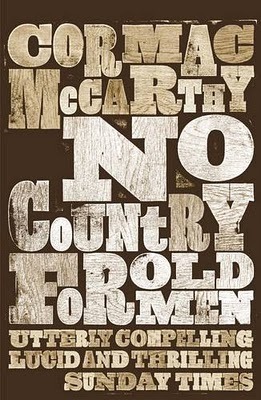 On the surface, McCarthy is weaving a modern day western aptly soaked in blood and ruthlessness, where the line between hero and villain is sharply drawn. On that same surface, what we have is a cast of archetypes – the weary sheriff who has stayed too long and seen too much; the everyday man living right until he is undone by greed; the young and dutiful wife committed to “standing by her man” no matter what; and finally, the relentless villain who will cut down any and all who cross his path. Even if you only read the book for that tale it is an awesome and rewarding one – tense, violent, dark, oppressive. Who will live? Who will die? But as you read, your brain is going to want to do a lot more thinking about the story; in fact, the story will demand it. Those archetypical characters will demand it too. Like a hologram, just shift them a few degrees to the right or left and they become much more nuanced than you first thought, showing other angles and deeper reflections. Who is Anton Chigurh? A blood-thirsty villain? an amoral badass? a demented sociopath? ... yes, yes and yes. But he also walks through the story doling out justice Old Testament style. There is that Biblical quality to him. You’ve committed your sins, and now the reaper has come a-calling. Not for vengeance, not for his pleasure, but for justice. Chigurh does not like loose ends. There is an order, a natural balance to things that must be maintained. The moment Llewelyn takes the money his fate is sealed. There is nothing from that moment on that will ever deter Chigurh from collecting on Llewelyn’s death and restoring "order". Yet, there is a randomness to Chigurh's killing philosophy in the sense that like the proverbial Hand of Death, there will always be innocent bystanders. “Innocence” does not compute, nor is it ever a factor. Bad things happen to good people all the time, even when you’re minding your own business you can be violently drawn into someone else’s. Is what we call random chance just destiny in disguise? There is nothing about being collateral damage that smacks of free will to me. I love Carla Jean. She is a heap of contradictions: vulnerable but strong, naïve but wise. She is loyal and loving and though she finds herself in a heap of trouble, does not buckle under the pressure. [Her confrontation with Chigurh is my favorite scene of the entire novel. I find it heartbreaking. This is an innocent facing death. It’s not fair, it shouldn’t be happening, but it is. Chigurh offers her a faint hope with the coin toss, but even that does not pan out for her. What breaks my heart the most about her death is that she went out of this life believing Llewellyn did not love her, that he had betrayed herLlewellyn is a good man. I don’t believe it's naked greed that makes him run off with the money, but a hope for a better life, an easier life for him and Carla Jean. I think he is a man filled with love and a lot of the choices he makes in this novel he makes thinking only of his young wife and the life he wants to give her. This novel made my head explode with questions. McCarthy gives the reader a lot to ponder and chew on, but there are just as many places where McCarthy is mute and leaves it up to the reader to do all the work and come up with some answers, and, as in life, answers are not easy to come by.